The perfect way to start your baby’s development. The innovative wrist rattles and foot finders fit comfortably on baby’s wrists and ankles. Their bright colours, cute faces and enchanting noises will have baby searching for their hands and feet. Fully machine washable. Comes in a gift box…. This toy costs approximately £9.99 (for the latest and best prices make sure you check our retailer list for the Lamaze Garden Bug Wrist and Feet Rattles above). 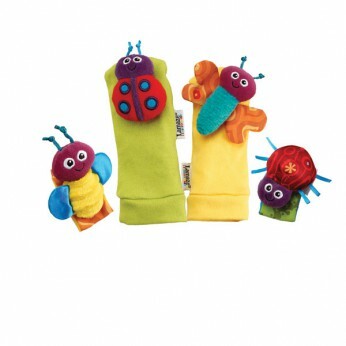 In our review of Lamaze Garden Bug Wrist and Feet Rattles we classed it as being suitable for ages 0 to 11 months but recommend you check the manufacturer specific advice before purchasing.